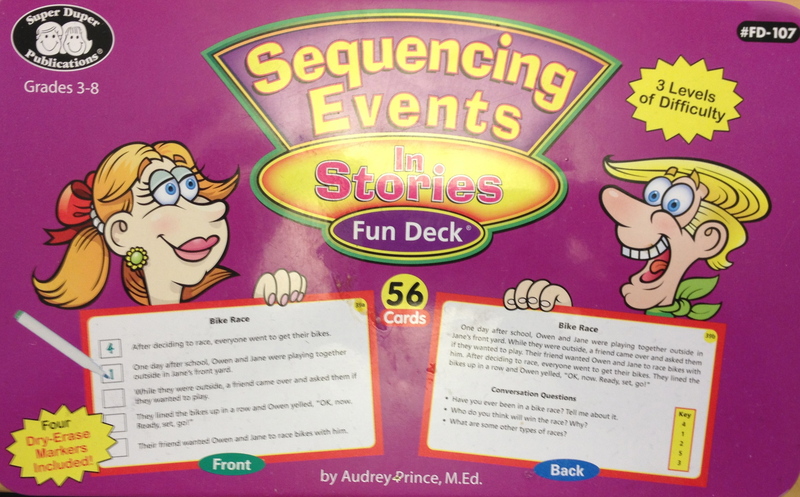 This Fun Deck® targets reading comprehension, reasoning, and writing skills. The deck has 56 cards with three levels of difficulty. The student reads the sentences, decides what the correct order should be, and uses wet- or dry-erase markers to sequence the sentences by number (1-5, depending on the sentence level). Card-Side B presents the story sentences arranged in correct sequence, an answer key, and three Conversation Questions for extension. Includes four dry-erase markers – all in a sturdy tin. This entry was posted in Learning Aids, Our Library and tagged Autism Spectrum Disorder. Bookmark the permalink.